Kim Vroon has a new vital task to enhance Kitamaat Village; get more waste into recycling, and out of the mouths of wildlife. Vroon has been tapped as Haisla Nation Council’s Recycling and Bear Aware Coordinator. Her mission, build a waste management plan for Kitamaat Village. 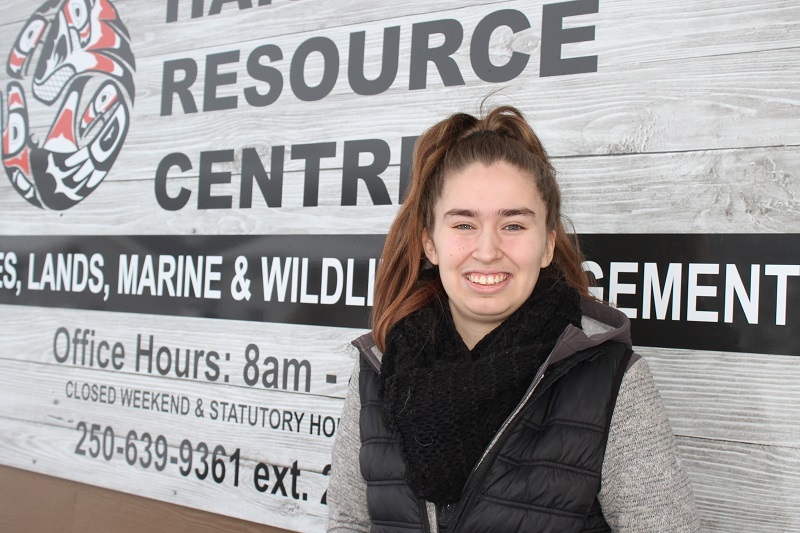 “I am super excited for this job,” said Vroon, in her office at the Haisla Resource Centre. Recycling, waste, and bears go hand-in-hand. Bears of course are attracted to human waste as a potentially easy source of food. That attraction to our garbage puts bears at-odds with community safety. Vroon is on board for a one-year term, and will start pushing recycling initiatives within Haisla Nation Council offices themselves and throughout the community. At just the very beginning of her year, Vroon is excited for the potential to make the community healthier and safer. Over the next while, residents of Kitamaat Village should notice gradual changes to our current community waste management system in the form of a recycling pilot project. The project aims to reduce and the amount of recyclable material discarded into our landfill through the gradual implementation of a step-by-step recycling program in our community. Phase one of the project will begin at our Haisla Community School, followed by community office buildings, and eventually expanded out to cover a residential recycling initiative. We are currently coordinating the idea of curbside collection for recyclable materials and plan to investigate the feasibility of establishing a recycling depot as well as plan information sessions and community events. An important part of this initiative will be about community engagement and communication. We want to make this transition as easy and straightforward as possible for our community. In doing so, we will be developing a website as well as a Facebook Page where people can access information regarding the project and any updates. If at any point community members have questions or concerns regarding the program they can contact the community’s new Recycling Coordinator, Kim Vroon, based out of the Resources office.